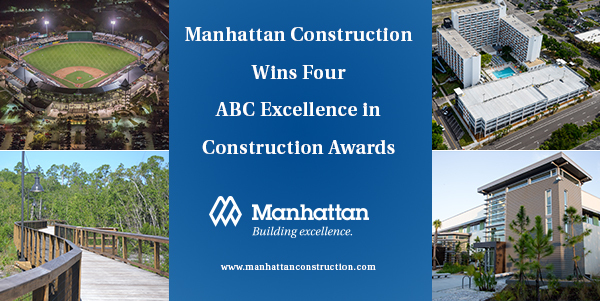 TAMPA – The Associated Builders & Contractors (ABC) Florida Gulf Coast Chapter honored Manhattan Construction with four Excellence in Construction Awards. Manhattan Construction team members were presented the honors at the awards banquet held Friday, April 17, at the Hilton Tampa Downtown in Tampa, Florida. Gordon River Greenway Park project in Naples, Florida won an Eagle Award in the “Construction of a Public Park” category. The 124-acre park included more than two miles of boardwalks and nature trails, shade structures, canoe/kayak launch facility, two pedestrian bridges and a new Naples Zoo parking facility. Manhattan Construction was the general contractor and Q Grady Minor & Associates was the engineer. CenturyLink Sports Complex Renovation – Improvements to the Minnesota Twins Spring Training Facility project in Fort Myers, Florida won an Eagle Award in the “Sports Complex Over $25 million” category. The phased project included a new residential player development academy, minor league clubhouse renovations, addition of a 360-degree boardwalk, new agility field and practice field, expanded and upgraded concourses, major league clubhouse expansion, press box renovations, new suites and upgraded seating. Manhattan Twins, A Joint Venture (Manhattan Construction, Chris-tel Construction, Casey Construction) was the construction manager and Populous was the architect. Urban Style Flats Parking Garage project in St. Petersburg, Florida won an Eagle Award in the “Commercial Construction Under $5 million” category. The 183,000-square-foot, four-story precast concrete parking garage provided 483 parking spaces. Manhattan Construction was the design-build contractor and TRC Worldwide Engineering was the engineer. Pasco County Data Center project in Dade City, Florida won a Merit Award in the “General Contractor Institutional $10-25 million” category. The 57,000-square-foot, two-story facility is used to house Pasco County’s information technology support systems and the supervisor of elections. Manhattan Construction was the general contractor and Fleischman Garcia Architects was the architect. Founded in 1896, Manhattan Construction is consistently recognized nationally by Engineering News-Record as a top general builder. Manhattan Construction operates from offices in Tulsa and Oklahoma City, Okla.; Dallas and Houston, Texas; Naples, Fort Myers, and Tampa, Florida; Washington, D.C.; and Atlanta, Georgia. Manhattan Construction’s building portfolio includes corporate headquarters, institutional, health care, office, hospitality and leisure, sports and entertainment, aviation, retail and government facilities throughout the United States, Mexico, Central America and the Caribbean. For more information visit: www.manhattanconstruction.com. Manhattan Construction Company Senior Superintendent Brent Collins has been selected by Oklahoma Magazine as a “40 Under 40 Class of 2015” honoree. Each year Oklahoma Magazine recognizes 40 young professionals who have worked hard to be successful at a young age. Collin’s profile story is located in Oklahoma Magazine’s April 2015 issue (page 69) and also on their website. During Collins’s 13 years at Manhattan Construction, he has been involved in more than $350 million in projects, including the Chesapeake Energy Arena Addition, Osler Hotel Renovation, First Council Casino, several projects for The University of Oklahoma, and most recently the Oklahoma Capitol Restoration – Interior Rehabilitation Project. In his spare time, Collins enjoys giving back to his community. He is a volunteer at WildCare Oklahoma, where he is managing the construction of a new rehabilitation facility. He also is involved with Rebuilding Together OKC, an organization that works to improve the homes and lives of low-income, elderly homeowners in the Oklahoma City metro area. Collins graduated with a construction science degree from the University of Oklahoma in 2001. He is also a LEED Accredited Professional (LEED AP), a certification earned through the U.S. Green Building Council (USGBC). You are currently browsing the Manhattan Construction Group blog archives for April, 2015.